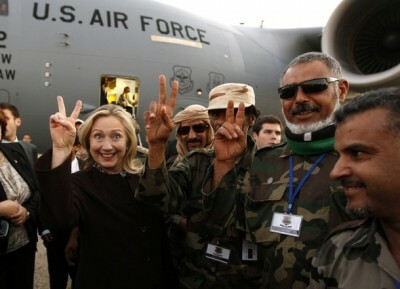 Photo: Hillary Clinton with the “Libyan rebels”. During an appearance on Fox News, General Thomas McInerney acknowledged that the United States “helped build ISIS” as a result of the group obtaining weapons from the Benghazi consulate in Libya which was attacked by jihadists in September 2012. Asked what he thought of the idea of arming so-called “moderate” Syrian rebels after FSA militants kidnapped UN peacekeepers in the Golan Heights, McInerney said the policy had been a failure. In May last year, Senator Rand Paul was one of the first to speculate that the truth behind Benghazi was linked to an illicit arms smuggling program that saw weapons being trafficked to terrorists in Syria as part of the United States’ proxy war against the Assad regime. “I’ve actually always suspected that, although I have no evidence, that maybe we were facilitating arms leaving Libya going through Turkey into Syria,” Paul told CNN, adding that he “never….quite understood the cover-up — if it was intentional or incompetence”. At the same time it emerged that the U.S. State Department had hired an Al-Qaeda offshoot organization, the February 17th Martyrs Brigade, to “defend” the Benghazi Mission months before the attack. Senator Paul was vindicated less than three months later when it emerged that the CIA had been subjecting its operatives to monthly polygraph tests in an effort to keep a lid on details of the arms smuggling operation being leaked. CNN subsequently reported that dozens of CIA agents were on the ground in Benghazi during the attack and that the polygraph tests were mandated in order to prevent operatives from talking to Congress or the media about a program that revolved around “secretly helping to move surface-to-air missiles out of Libya, through Turkey, and into the hands of Syrian rebels.” Key Syrian rebel leaders later defected to join ISIS. In addition to ISIS obtaining weapons from Benghazi, many members of the group were also trained by the United States at a secret base in Jordan in 2012. As we have previously documented, many of the United States’ biggest allies in the region, including Saudi Arabia, Kuwait, Turkey and Qatar, have all bankrolled and armed ISIS militants.